Welcome to the Mason book site. Embedding Perl in HTML with Mason was published by O'Reilly and Associates in October of 2002. The ability to create modular, re-usable components like headers, footers, or menus. You only need to make changes once. Integrated parameter handling for web requests. Built-in caching as well as a user-accessible cache API. Integration with mod_perl for speed and flexibility. Content filtering - anything from a small piece of a component to an entire site. 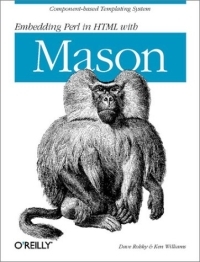 The Embedding Perl in HTML with Mason book documents the HTML::Mason framework in detail, including chapters on component syntax, Mason object APIs, a sample site walkthrough, recipes, and details on Mason's advanced features and how to use them. The entire book will be freely available online, though we of course encourage you to buy a copy.